In a recent post, I mentioned that I sampled the woodland pool near the house earlier in the week. The Marbled Salamander larvae have grown considerably since my last visit. Almost every dip of the net brought up one or more of the large, squirming pool predators. When first caught, they were very dark, which is typical of these larvae. But, after being in a bucket overnight, the few I brought to the house turned a much lighter color than normal. I placed them in my small photo tank for a few shots the next morning before taking them back to the pool to set them free. Marbled Salamander larvae are easily distinguished by being the largest salamander larvae in area woodland pools this time of year. This is because, unlike the rest of our pool-dwelling species, they hatch in the fall, rather than the spring. The row of light spots along their sides is another diagnostic feature. The ones I caught this week were all large, between 2 and 3 inches in length. In this area, they usually transform and leave the pools in April or May, so these guys are just about ready to become full-time land-dwellers. When they hatch, Marbled larvae feed on zooplankton and small macroinvertebrates. 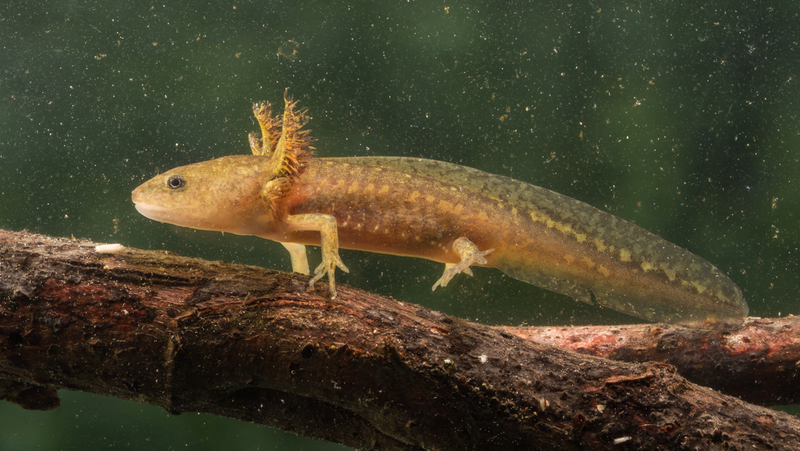 By the time spring arrives, they are large enough to gulp down much larger prey, including the hatching larvae of a common pool neighbor, the Spotted Salamander. 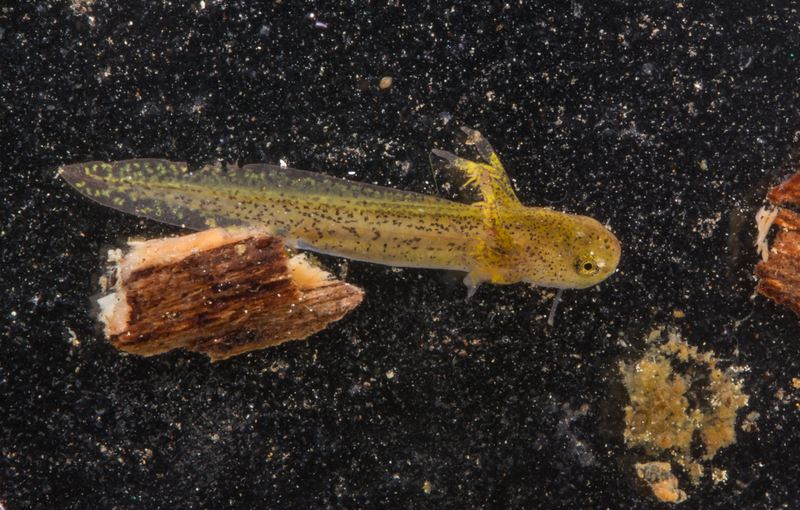 The photo above shows a newly hatched Spotted larva caught in the pool this week. It is less than an inch long and still has the balancers, the two fleshy appendages under the head that help them maintain an upright position in the water. These are present for only the first week or so after hatching. Look closely at the image and you can see one pointing downward between the eye and the gill of the larva. With the number of Spotted egg masses that are just now hatching, there is a buffet of small prey available to the Marbled Salamander larvae. They patrol the pool and use a lunge and gulp feeding strategy to capture a variety of other organisms as well, including small tadpoles, aquatic insects, and even terrestrial insects that fall into the pool. If food is scarce they are also known to nibble on their cousins, so it is not uncommon to see Marbled larvae missing portions of their tail or limbs. I plan to visit the pool again over the next few weeks and look for transforming juveniles around the edges. 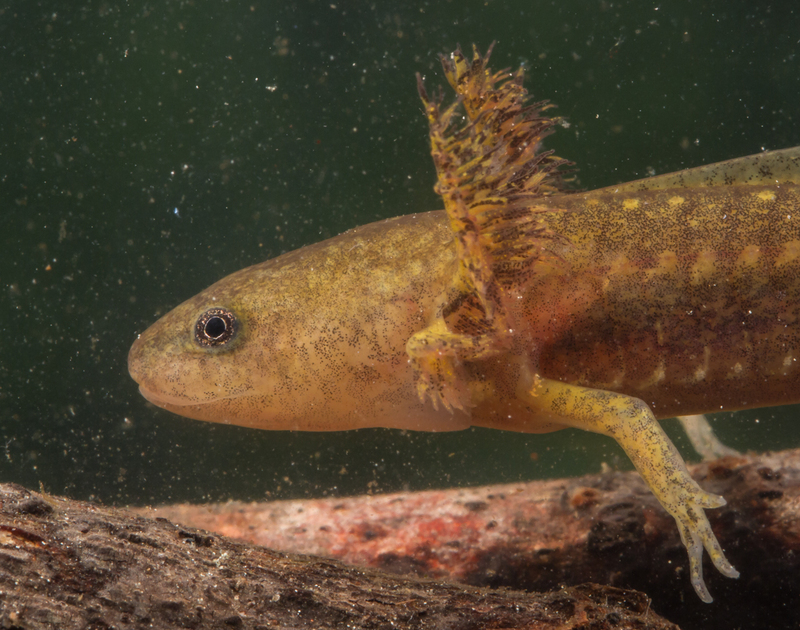 They will lose the bushy external gills and crawl out of the water to begin a terrestrial life, returning to this, or another low-lying spot, only to mate and lay eggs in the fall. Marbled Salamanders are among the many interesting and beautiful creatures that require these fish-less woodland pools to survive. But I worry about the future of many of these pools. I worry that fewer and fewer people know about the beauty and wonder that lies just beneath the surface of such shallow water habitats, and see them, instead, as just a mosquito hole or a place to drain and tidy up. It doesn’t take much disturbance to the landscape to alter the hydrology of a wetland area and leave it high and dry, eliminating this critical habitat for so many of our fascinating neighbors. If you, or someone you know, has such a pool on your property, I encourage you to sit by it, dip a net in it, get to know it and the inhabitants, and protect it. Our world will be a better place if you do. This entry was posted in Natural History and tagged marbled salamander, woodland pool by roadsendnaturalist. Bookmark the permalink. Vary cool pictures! Especially the close-up of the external gills! Thanks! Thanks, Suzy. I have to admit, I think these critters are so cool. Mike, how big are the little salamanders in these images????? 1/2 inch???? The Marbled larvae are about 2 inches plus. 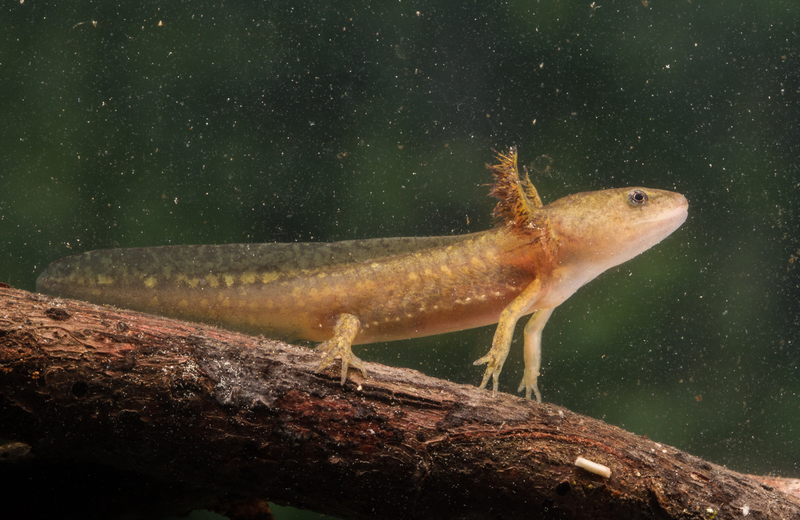 The small Spotted Salamander larva is between 1/2 and 1 inch in total length, but will grow considerably over the next couple of months.